With summer fast approaching, you might be thinking about backyard cookouts, dinner on the patio or spending lazy afternoons in the pool with family and friends. Enhance your poolside experience by building a pool house plan. 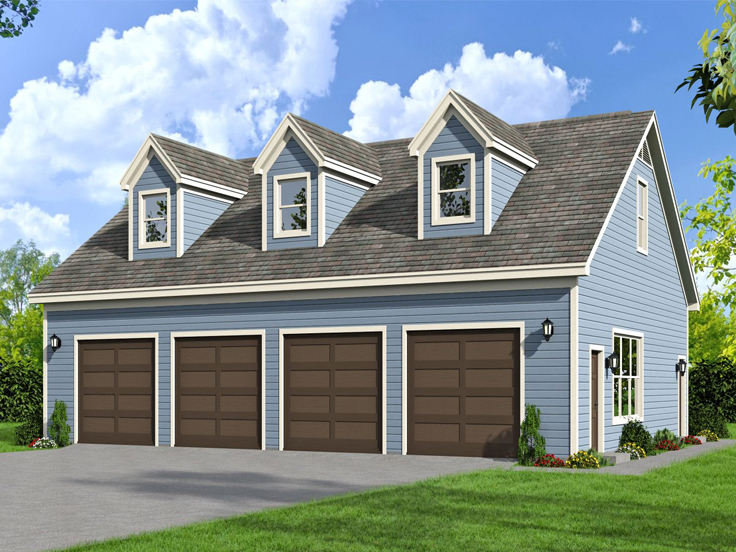 Our pool house plans are available in a broad range of sizes and styles. All these designs offer a half bath or space for change clothes at the minimum. But some pool houses have so much more to offer, like a covered porch for shady respite from the sun, an outdoor kitchen or grill, full bath, pool storage or even a guest room! With so many special features to choose from, it will be easy to find a pool house plan that fits neatly in your backyard and accommodates your needs. Below is a sampling of the pool house plans we offer. Carefully consider which one is right for you. 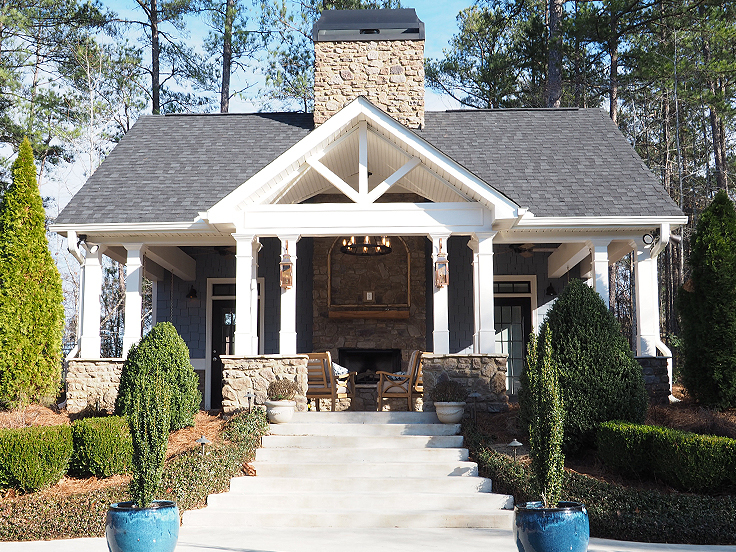 019P-0001: A handsome exterior shows off decorative details like stone pedestals and the exposed porch beams with this stunning pool house plan. Spacious, yet cozy, the covered terrace offers a protected outdoor lounging space with an attractive stone fireplace. It’s the perfect place to enjoy a snack with the kids or a cold drink with friends. The full bath includes a shower with a convenient seat. Utilize the studio space as an indoor gathering place, exercise room, or guest room. 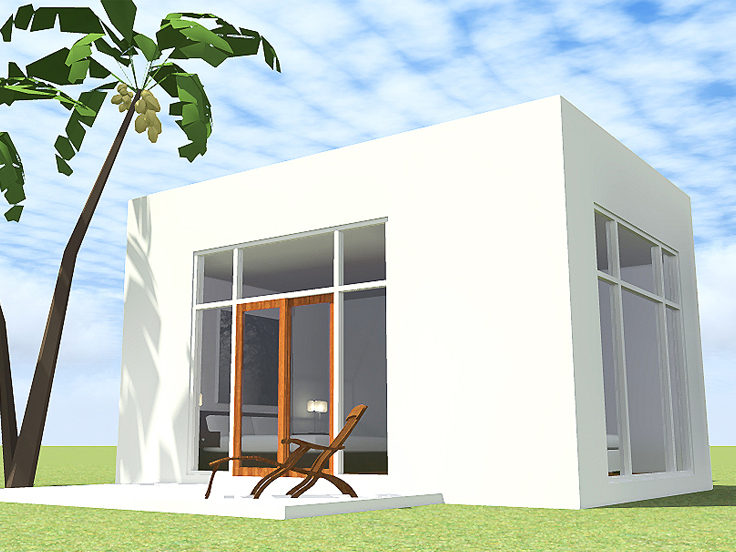 052X-0003: Think outside the box with this modern pool house plan. Walls of windows allow natural light to flow indoors and brighten the space. With a full bath and ample loft space, this structure is flexible enough to serve as guest room, are studio, or workout room when it’s not swimming season. There’s even a patio to enjoy the outdoors grilling, feasting, or sunbathing. Expand your possibilities with this fresh design. 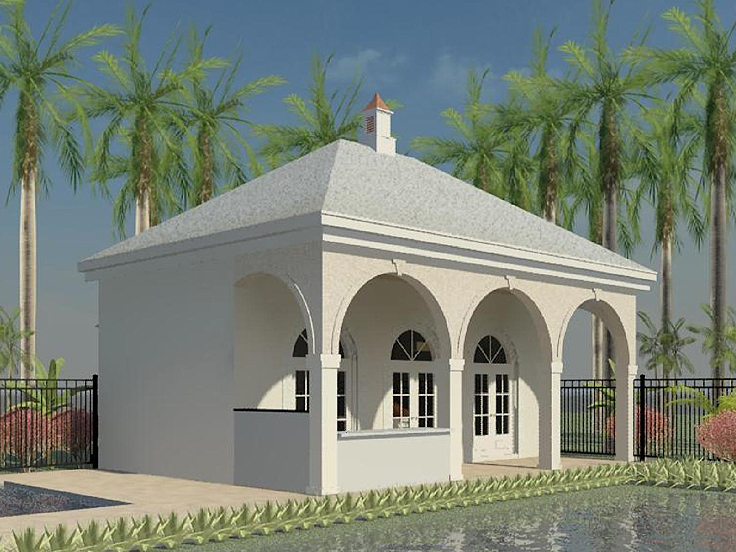 006P-0013: With its stunning façade and arched doorways this pool house plan would blend well with a Mediterranean or Sunbelt home. A wet bar on the covered porch serves poolside. Celebrate the kids’ birthdays with family and friends and enjoy a piece of cake and a snack in the party room. Inside the coffee bar offer more refreshments. A full bath provides a shower for guests and a place to change after swimming. Outside access to a storage room offers a convenient place to stow away pool toys, tools, and chemicals. 035P-0002: This is easily the Taj Mahal of pool house plans! What a beautiful and convenient way to entertain guests or clients in its clubhouse, complete with kitchenette and full bath. A two-story ceiling delivers a spacious feel. The clubhouse is the perfect place for the media center with comfy chairs, or clear the room, add a disco ball, and dance the night away. Bi-fold glass doors open to the covered patio extending the gathering space outdoors where a stone fireplace adds to the atmosphere. With additional patio space, there is plenty of room to enjoy a party with friends and family. With its majestic columns and stunning arched glass window, this design is an attractive and clever way to extend your residence! 062G-0071: It’s a garage. It’s a pool house. Yes, it’s a garage and a pool house. The garage provides space for four cars. But on the flip side, I mean pool side, enter to a hallway that leads to a full bath on one side and an exercise room on the other. Possibilities become endless by taking the interior stairs to loft space. It features an outside balcony overlooking the pool. What a fantastic place for a home office, game room, home theater, or space to house guests or kids that have come back home to roost. 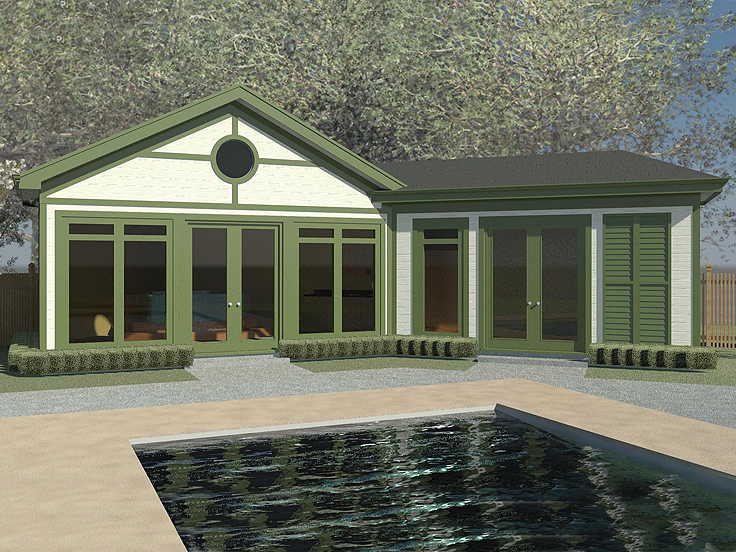 006P-0007: Here’s an attractive pool house plan that offers a vaulted cabana room for sheltering a hot tub. If you need to get out of the sun, but still wish to soothe your body, this is the place for you. A sitting room provides an area for swimmers to change and a sauna for warming up after the sunsets. Grab a snack or a drink from the kitchenette and lounge for a while, protected from the sun. There’s a handy storage closet with an outside door for storing pool chemicals, patio furniture or water toys. For more possibilities, take some time to browse our entire collection of Pool House Plans.